If you’re planning a Christmas party or New Year’s Eve celebration, here are some fabulous drinks to help get the party started! * indicates affiliate links – this site receives a small fee from purchases made through these links. Food and drink play an important role in any celebration, and Christmas is no exception. So I’ve pulled together some of my top suggestions for Christmas drinks, including suggestions for both alcoholic and non-alcoholic options. Gin remains incredibly popular, and an unusual gin is a great addition to your Christmas drinks selection. Cuckoo Gin is a brand that I came across when I visited the Good Food Show. It is a lovely dry, junipery gin from the Brindle Distillery in Lancashire. With botanicals that include orange, grapefruit, cinnamon and liquorice, this is a warming gin that is ideal for sipping as well as for mixing into cocktails. Now I have to admit that you won’t be able to get hold of the second gin in the picture above. It’s Red Leaf Gin from the Langley Distillery, and I received it as part of the now defunct One Time Gin box. But why not take a look at your local wine shop, or even in the supermarkets and see what new gins you can find there. I saw an impressive range at Asda recently, including gins like Gunpowder Gin. And you can also pick up some unusual gins on Amazon – like the Douglas Fir Gin* from Twisted Spirits. That even sounds Christmassy! And if you’re looking for something different to mix with your gin, then Fentimans have masses of options to try. They have a range of tonic waters which includes a zingy Pink Grapefuit tonic. Or you could try the Botanical Tonic Water if you prefer something more floral. And their Mediterranean Orange Tonic Water is a great addition to the range, made with Valencian oranges and lemon thyme. It’s perfect for the festive season. Or if you prefer a classic G&T, then Fentimans Premium Indian Tonic Water and their Naturally Light Tonic Water are a great complement to your favourite gin. And if you’re looking for a soft drink with a difference, check out Fentimans’ botanically brewed soft drinks. Flavours like Rose Lemonade and Ginger Beer & Muddled Lime make a great change for the designated drivers and anyone else who isn’t drinking alcohol. They also make easy cocktail options – simply serve in a big pitcher with plenty of ice. You could try adding gin or vodka to the Rose Lemonade, or adding a dark rum to the Ginger Beer & Muddled Lime. And Belvoir Fruit Farms are another brand with some great options this Christmas. 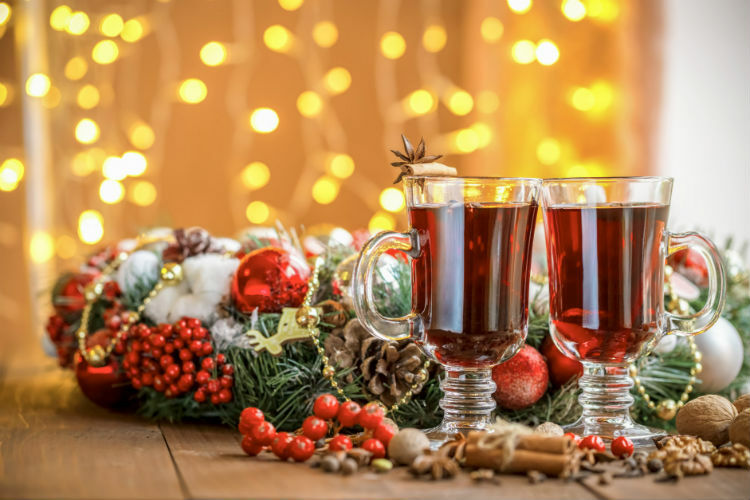 Their Mulled Winter Cordial is a rich, festive blend of cranberry, blackcurrant and orange juices with a hint of lime juice and warming winter spices. It contains no artificial additives, preservatives or sweeteners. You can enjoy this cordial hot or cold, or try adding rum or vodka for a cheeky hot toddy. Click here to find your nearest Belvoir Fruit Farms stockist. Or for another alcohol-free option, why not mix up some delicious mocktails using Spice Drops® from Holy Lama. Spice Drops are highly concentrated extracts of herbs, spices, fruits and flowers, made using natural ingredients with no artificial colours, flavours or preservatives. There are 34 varieties in the range, and every 5ml bottle contains around 150 drops. They can instantly transform a plain drink into something special. You could add a couple of drops of Rose Spice Drops® to a glass of lemonade, or maybe try adding cardamom, cinnamon or even saffron for colour and a distinctive flavour. Cola can be livened up with a hint of ginger or simply add Orange, Lime or Lemon Spice Drops® to sparkling water for a fruit flavoured thirst quencher. And there’s even a Mulling Spices Spice Drops® which you can add to warmed blackcurrant juice for all the flavour of mulled wine without the alcohol. Next on the list is Haig Club Clubman whisky. This is a single grain whisky matured in bourbon casks, and has a smooth, light flavour with notes of vanilla and dried fruit. It’s perfect for serving neat or over ice, and is also ideal for use in cocktails. That might be something as simple as mixing Haig Club Clubman with cola and a squeeze of lime. Or why not try the Haig Club Winter Spiced Espresso Martini, a decadent twist on the classic cocktail. Fill a cocktail shaker with ice, and pour over 50ml Haig Club Clubman, 50ml Crème de Cacao, 50ml Espresso and a pinch of cinnamon. Give it all a good shake, and then strain into a martini glass, before garnishing with a few coffee beans. Delicious! Both Haig Clubman and the original Haig Club whisky are ideal for Christmas drinks. Of course Baileys Irish Cream is one of the quintessential Christmas drinks, and it’s delicious served over ice for sipping. But why not try a Chocolate Blitzen this Christmas? Simply add 15ml vodka, 15ml Crème de Cacao and 30ml Baileys Irish Cream into a blender with a generous scoop of chocolate ice cream. Blend until smooth, but don’t let the icecream become totally liquid – you want it to be a thick creamy drink. And my final recommendation for this year’s festive drinks round up didn’t make it into the picture at the top of the page. It’s another drink that I sampled at the Good Food Show, this time a distilled non-alcoholic spirit from Seedlip drinks. There are now three different flavours in the Seedlip range. Their Spice 94 variety is full of warming spice flavours and zingy citrus, and it’s a great alcohol-free drinks option. I hope you’ve enjoyed my selection of Christmas drinks. What will you be serving at your Christmas party?